Late fall Lake Erie steelhead hen that could not resist a Nagy Steelie Rock Worm caddis larvae pattern. On November 13, 2015 the Lake Erie water temperature (degrees F) off Toledo was 49, off Cleveland was 55, off Erie was 54 and off Buffalo was 52. 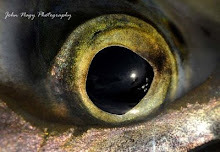 Michigan Congresswoman Candice Miller and Senator Debbie Stabenow introduced federal legislation in February (2015) called the Defending Our Great Lakes Act to slow the spread of invasive species such as Asian Carp through the Chicago waterways into Lake Michigan and the Great Lakes. Federal legislation introduced last year in congress to provided complete hydrological separation of the Mississippi River basin and the Great Lakes (as recommended in a study by the U.S. Army Corps. of Engineers) stalled in congress last year due to high costs (estimated to be $15 billion) and conflicts among interests groups including conservation groups and the shipping industry. The new legislation would allow the Corps to install electric barriers, underwater sound cannons, carbon dioxide bubble screens and pheromones to stymie the movement of Asian Carp upstream. Scientist believe that the voracious Asian Carp could have devastating effects on the $7 billion sport fishing industry in the Great Lakes. Biologist have already confirmed the presence of Asian Carp DNA in the Chicago Area Waterway System and Lake Michigan. They believe, though, if there are a few fish in the Lake Michigan (or in close proximity to it) it is not likely they will reproduce. The key at this stage is to keep their populations down to inhibit any natural reproduction. The increased sea lamprey population in Lake Erie has traditionally been documented by wounding rates on lake trout in Lake Erie. 2014 NYDEC lake trout wounding rate data was 3 times above target levels in 2014. Sea lamprey nest counts and spawning phase sea lamprey trapping data has also indicated a high population of sea lampreys in Lake Erie. Numerous sea lamprey larval assessments were done by the US Fish & Wildlife Service (USF&WS) in the Lake Erie watershed (in 2014) to search for new populations of sea lamprey and to monitor existing populations in 36 tributaries including one offshore area in Lake Erie. A new population of larval sea lampreys was found in Big Sister Creek, NY. Also a section of the Niagra River was surveyed and showed larval sea lamprey. The St Clair River survey enabled the USF&WS to project larval sea lamprey abundance in the St. Clair to be now 919,509. A total of 5,816 adult sea lampreys were captured at 6 trap sites (5 tributaries) in 2014. The estimated number of adult sea lampreys in Lake Erie during 2014 was 14,577 which was much greater than the desirable target range of 3,800 (plus or minus 1200). All sea lamprey caught in adult assessment traps in Lake Erie tributaries were scanned for coded wire tags. The tags are part of a 2012-2015 mark-recapture study by the USF&WS to determine if marked sea lampreys released in the St. Clair River can survive and be recaptured in eastern Lake Erie. In 2014, tags were collected from 10 lampreys (3 released in the St. Clair River, 7 released in Lake Erie tributaries). Analysis of the mark-recapture study data will be done by USF&WS during the winter of 2015. Sea lamprey control plans in 2015 include lampricide treatments for 7 Lake Erie streams including: Canadaway, Conneaut and Raccoon Creeks, Paint River (Clinton River trib), Cayuga River (Buffalo River trib), Big Sister Creek and Komoka Creek (Thames River trib, Ontario). The Paint, Cayuga, Big Sister and Komoka will receive first time treatments. USF&WS field crews also plan to visit lamprey barrier sites on U.S. tributaries (which are typically dam locations) to perform barrier inspections and update current barrier inventory data within the Barrier Inventory and Project Selection System (BIPSS) database. 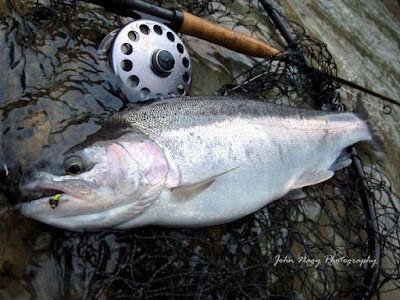 According to Kevin Kayle, Hatcheries Manager for the Ohio Department of Wildlife (ODW), Ohio was unable to obtain steelhead eggs from the Michigan Department of Natural Resources (MDNR) this past spring (2015). 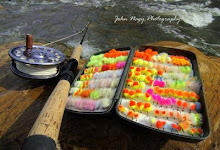 The MDNR had difficulty collecting collecting steelhead eggs at the MDNR weir on the Little Manistee River last March. This reduction in eggs had the potential to negatively impact the MDNR’s annual steelhead production in their hatchery facilities as well as hatcheries in Indiana and Ohio. To make up for this shortfall, the ODW in early May (2015), procured 200,000 fertilized steelhead eggs from Wisconsin (Chambers Creek and Ganaraska Strain) and 210,000 Little Manistee steelhead fingerlings from the MDNR this past September (2015). 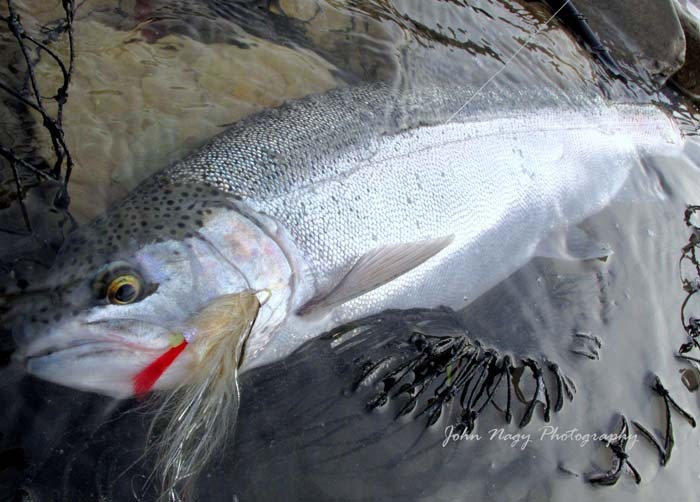 This should enable the ODW to get close their annual steelhead stocking target of 450,000 steelhead for 2016. Kayle says the ODW is considering collecting their own steelhead eggs from returning brood stock in the future. But first they need to review potential hatchery disease issues, brood stock health and hatchery modifications for collecting and processing steelhead for eggs. An Integrated Detailed Project Report (IDPR) for the Harpersfield Dam (Grand River, OH) lamprey barrier project was completed this past September (2015) by the U.S. Army Corps. of Engineers (USACE). The IDPR addresses the serious issue of the Harpersfield Dam being an unreliable barrier to the upstream migration of sea lamprey due to its sloping downstream face and lack of horizontal lip at its crest. The USACE has determined that the existing structure has a sloped crest and will not provide a sufficient drop during a 10 year flood event. It is estimated it would cost $335,000 for lampricide treatment above the dam (every 3-4 years) if lampreys are able to bypass the dam and spawn in the upper Grand River watershed. Presently the Grand River (below the dam) is treated with lampricide every 3-4 years at a cost of $157,000 by the U.S. Fish & Wildlife Service. The IDPR also addresses large cracks in the existing Harpersfield dam which may allow the passage of sea lamprey and deteriorated and cracked abutment/embankment walls. 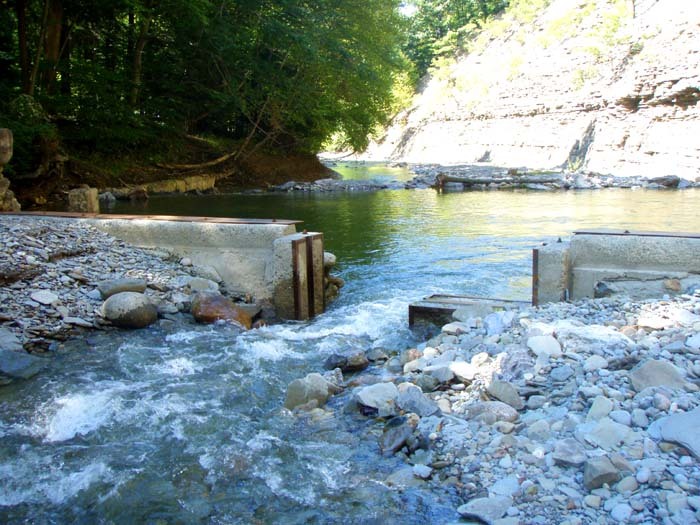 In the IDPR, the USACE recommended an onsite rebuild, constructing a “cast-in-place” barrier (including a steel lip) upstream of the Harpersfield Dam (which will be partially removed). The new barrier will include lamprey traps that will be checked and maintained by the U.S. Fish & Wildlife Service. No fish passage devices will be incorporated into the new barrier. After partnership agreements are signed (by July 2016), engineering and design work for the project should be completed by January 2017 with construction projected to be completed in November 2018. Total costs for the project are estimated to be $6 million. Another fall "chromer" that crushed a Nagy Lake Erie Emerald Shiner tube fly (Scandinavian style design) on a swing. Emerald shiner populations have boomed on the Lake Erie shoreline and tributaries this fall. This past year the Pennsylvania Fish & Boat Commission (PF&BC) has acquired three new public fishing easements/acquisitions for steelhead fishing in Erie County, PA. Using funds from the Lake Erie Access Improvement Program (LEAIP) the Commission has added the East Branch of Conneaut Creek upstream of Cherry Hill Rd. (6,295 ft. of stream frontage/both sides), the Main Branch of Conneaut Creek between Springboro and Conneautville (4,960 ft. of stream frontage/both sides) and 12 Mile Creek south of Rt. 5 (2 Acres). The PF&BC started the Lake Erie Access Improvement Program (LEAIP) in 2006. Funded by the Lake Erie Fishing Permit Program (and matching funds), LEAIP has been extraordinarily successful. As of August, 2015 LEAIP has obtained 32 property easements and 13 land acquisitions from private landowners (a total of 20 miles of stream frontage since 2006 with over 4 million dollars spent so far). These properties provide much needed public fishing access (including riparian buffer zones) on tributaries such as Crooked Creek, Elk Creek, Walnut Creek and Twenty Mile Creeks. The LEAIP program also provides funds for the protection of fish habitat, construction of public parking areas and signage along LEAIP acquired easements and properties. Based on an ongoing feasibility study (Springville Dam Ecosystem Restoration Project) by the U.S. Army Corps of Engineers (USACE), the New York Department of Environmental Conservation (NYDEC), Erie County, NY and the USACE in August (2015) have approved a project to lower the deteriorating, 92 year old Springville Dam (aka Scoby Dam) on Cattaraugus Creek, NY to 13 feet and install a rock riffle ramp to facilitate fish passage above the dam. The rock ramp will also feature a track to catch migrating sea lampreys trying to get above the dam. A final phase of the project work will involve excavating the dam pool created by the modifications to facilitate the passage of sediment below the dam. These modifications would further develop the wild steelhead fishery on Cattaraugus Creek (there is ideal habitat for natural reproduction above the dam) and also open up 34 miles of existing NY State Public Fishing Rights land easements above the dam to public steelhead fishing. After project partnership agreements are signed, the project can proceed to the design and construction phases. Funding for the project is estimated to be around $6.6 million with 65% of the costs to be picked up by the federal government (through the Great Lakes Restoration Initiative Program) with the balance from the NYDEC and Erie County, NY. The design phase of the project is planned to start in 2016 or 2017 with construction to commence in the summer of 2018. According to the NYDEC, fishing regulations above the Springville Dam on Cattaraugus Creek will stay in place after dam modifications are complete. Current NYDEC regulations classify the water above the dam under special fishing regulations (for the inland trout fishery already in place) with catch and release from October 16-March 31 (including artificial lures only). From April 1-Oct 15, 5 trout are allowed to be harvested (both artificial lures and bait) with no more than 2 longer than 12 inches. The NYDEC plans to evaluate these regulations after the impact of steelhead runs above the dam (with the resident trout population) is better understood. Work by the Chautauqua County Soil and Water Conservation District has nearly been completed this past summer to repair fish passage project dams on Chautauqua Creek, NY that were damaged from flooding in 2013 and 2014. The upper rock ramp has been re-rocked and pinned and the pool level of the lower dam has been raised to allow steelhead to more easily pass through the dam. In 2016 the trestle pool dam on Chautauqua Creek (further down river from the rock ramp and lower dam) will also have its pool level raised to more easily allow fish passage upstream. Repaired lower dam on Chautauqua Creek. NYDEC Photo. The NYDEC will be doing a number of steelhead related projects/studies in Western NY this year including: release a new Steelhead Management Plan (November 2015) which includes a 30 day public review period, access fish passage on Chautauqua Creek and continue a size/stocking site study of tagged steelhead smolts on Chautauqua Creek. The results of the tag study should show how steelhead smolt size (less than 5 inch versus greater than 5 inch) and stocking location (upper versus lower river locations) affects steelhead “smolting” and adult return rates. This data should be very useful in future NYDEC steelhead stocking practices and ultimately improve the steelhead fishery in NY’s Lake Erie tributaries. Jim Markham, Aquatic Biologist for the NYDEC, related that a tributary creel survey was completed on several Lake Erie steelhead tributaries of Western NY last year. Overall the survey showed that catch rates have stayed down to .32 fish/hour (versus record highs of .6 fish/hour 10 years ago). 18 Mile Creek showed a big improvement in catch rates, Chautauqua and Canadaway Creeks were on the downside and Cattaraugus Creek was slightly down but steady. 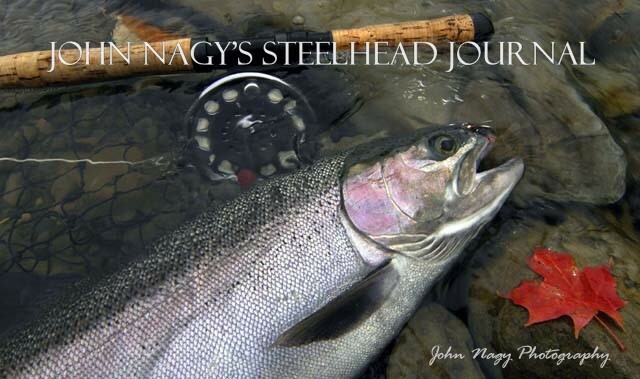 More detailed information on fly fishing for Great Lakes Steelhead can be found in John Nagy’s classic book “Steelhead Guide, Fly Fishing Techniques and Strategies for Lake Erie Steelhead” His new “Steelheader’s Journal” makes a great companion book to the Steelhead Guide. Both books are available by going to the right menu bar for ordering information.